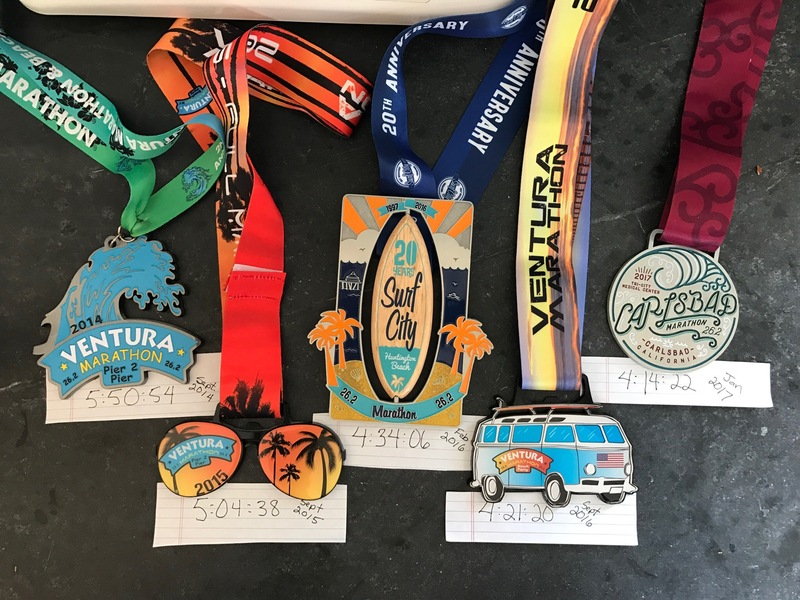 Ventura Marathon Race Recap – How’d that untethering go? 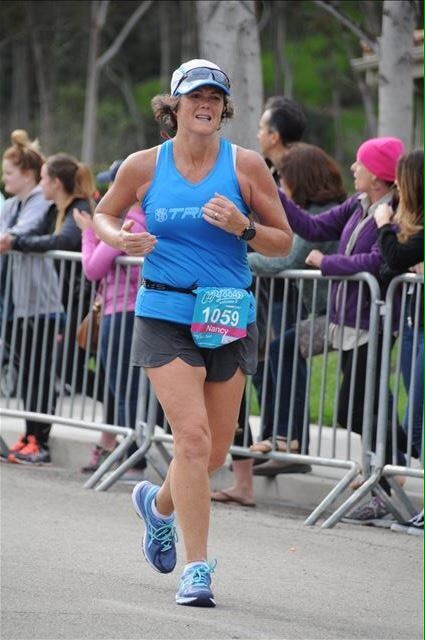 Last Sunday I ran my 7th marathon…that’s hard to believe! My only goal for this race was to run it completely by effort, and to avoid looking at any of the data on my watch (Untethering – Kind of, Maybe). Prior to the race I set the data screen to only show mileage. My rational for wearing my Garmin was to keep track of my food intake, and to have data post race. I was not able to turn off the mile split notifications so it required tremendous willpower to “not look” every time I felt the, completion of another mile, vibration on my wrist. So how’d it go? The pre-race challenge was the weather forecast. Cool at sunrise, but getting hot quickly. One forecast literally said, “sizzling sunshine.” That was ominous. Some of us said, we’ll have to run really fast to finish before that sizzling sunshine could melt us. Thankfully the race started at 6:30am. The only picture I took was in the pre-start darkness… a beautiful pre-sunrise shot of the coming day. The race started with a slight uphill start. We actually ran a big loop before heading down to Ventura and I ran this loop pretty well. Mile six of it was a long gradual uphill that took us back to the starting line. I went easy so as not to feel the effects of overexertion later in the race. So many people were passing me. Should I have pushed harder here? Probably not. At mile 9 we enter the Ojai Valley Trail. This trail was mostly flat, with a slight uphill in places as it traversed across Ojai. We weren’t on it long before we turned left and headed downhill towards Ventura. At this point the temperature was still cool. At mile 12, I accidentally looked at my Garmin when my wrist vibrated. My reaction? First “oops,” followed by “damn!” I’d just run an 8:35 mile. I felt good, but was that too fast? Running down the upper part of the trail was fun. It was mostly shady and cool. My church worked the water station at mile 15. It was nice to see the church members out there. My friends who was assisting our church later told me that she was “so cold.” That cool weather was wonderful! At about mile 16 my left quad started hurting, and maybe not so coincidentally mile 16 was my last sub 9 minute mile. I don’t know why it started hurting so quickly. Pace? Downhill? I’ve trained very well (I thought) on hills and have been diligent about strength training. So? 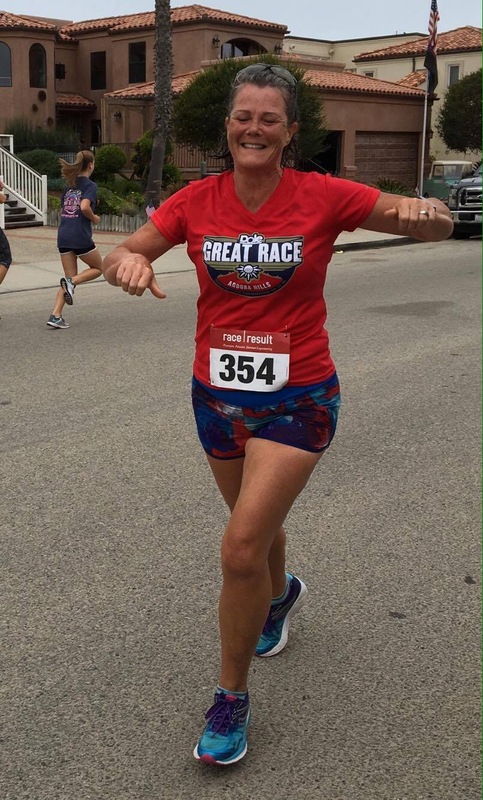 Part of me wonders if maybe I hadn’t fully recovered from the very intense downhill Cottonwood Canyon Half Marathon (Revel Big Cottonwood Canyon Half Marathon Recap). That was 6 weeks ago, so it shouldn’t have been a factor. But for whatever reason my left quad was not happy. See how wet my shorts are? I dumped water on my head at every aid station and it all went to my shorts. Total form breakdown here! Miles 18-22 were real slogs. Here the course, while still downhill, levels out. So, the slight downhill doesn’t feel like much. I felt as if I were going slower and slower and slower. I seriously thought I was running in slow motion. And because of this, I succumbed to temptation and looked at my Garmin when it vibrated to tell me I’d completed mile 22. Much to my surprise I was at 3:21. This was amazing and I realized that if I could just hold to a 10 minute mile or better pace, I’d have another PR. Of course, this led me to keep looking. It’s like the dieter who eats one cookie and then binges…I began looking at every split. But then mile 24 was 10:14. “I’m sooooo tired and my leg hurts, but if I can just stay steady. Mile 25 and its slight uphill, 11:31. “Meltdown in full progress, just get me outta here.” Here I resorted to stride for 20 steps, run easy, stride for 20 steps, run easy…and so on. Of course the stride didn’t look like much of a stride but it kept me going. Mile 26, yeah a downhill at San Jon… but it was no help on sore, tired legs and an overheated body… 12:04. “Don’t walk. Don’t walk. I want to walk. Don’t walk. I want to walk. Almost there. Don’t walk. Last .20. I saw my family and they were a welcome sight! Megan ran alongside, “come on Mom! you’ve got this.” And with a smile of relief I crossed the finish line in 4:07:47. This was my 2nd best marathon. I technically qualifies for Boston and prior to the 2018 field cutoff of just over 3 minutes I would feel confident that I have a good cushion at 2:13 under the required time. I won’t be going in 2019 anyway (conflict with work) but it’s nice knowing that in spite of my struggle I was able to run another qualifying time. I was also 9th in my age group (out of 51). Lesson. I learned that I can run well by effort but that I also need to practice this more. While I gave in at the end and started looking, I wasn’t able to continually look because I had set my Garmin to make that impossible. I think that a lesson for me is that moderation is ok. The occasional check is ok. Obsession with pace is not ok. I don’t know how I’d have done if I hadn’t looked those last few miles. I think that knowing I was so close helped for a bit. I do know that I left it all out there. After I crossed the finish line, I was spent! My hand was shaking as I tried to drink my water. I took in lots of fluids (water, pineapple juice, and ice cold beer), and ate some fruit and a waffle. I would have loved to have had an ice cold chocolate milk in place of the beer, but the cold drink was helpful. After sitting (in the sun) for a little while, I had to move to some shade. I felt woozy…having fainted in my younger days, I know I was close but put my head down for a bit then got up slowly to walk towards some shade. Matt (my son) stayed with me…maybe to help should I faint. I went to the Saucony booth for my BQ shirt. Went to the Mile 26 booth for a short visit. Then too lunch. Megan (my daughter) walked with me to the restaurant where we decided to eat lunch. I chose to walk because as sore as I was, I knew I needed that short walk for recovery. I have to say that I have wonderful kids! My next marathon is BOSTON! Yeah! But first I have to get through the Ray Miller 50k on December 2nd. Yikes! 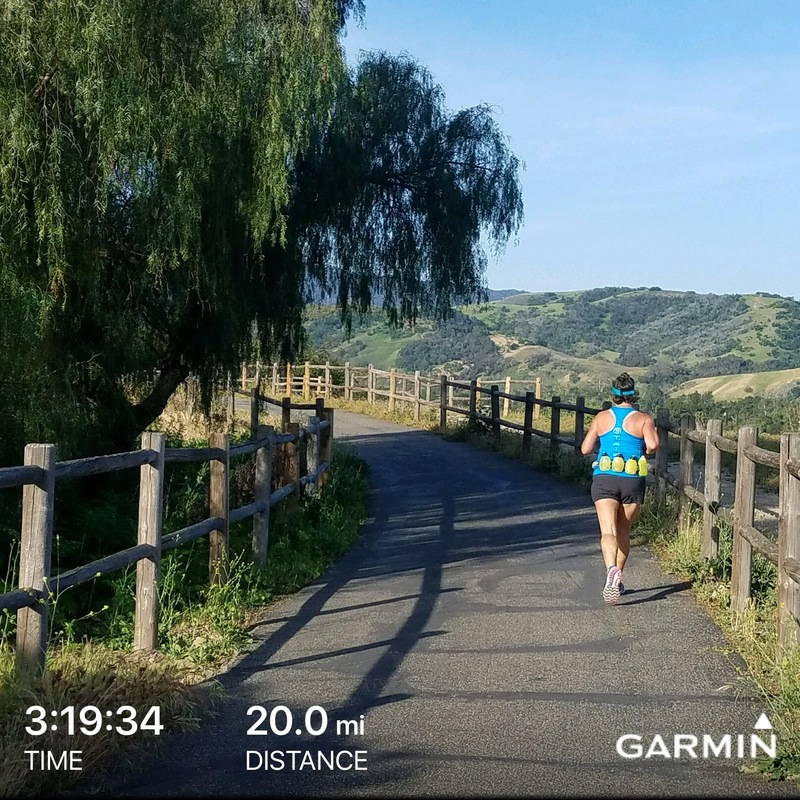 One of my course long runs…remember to enjoy the scenery! 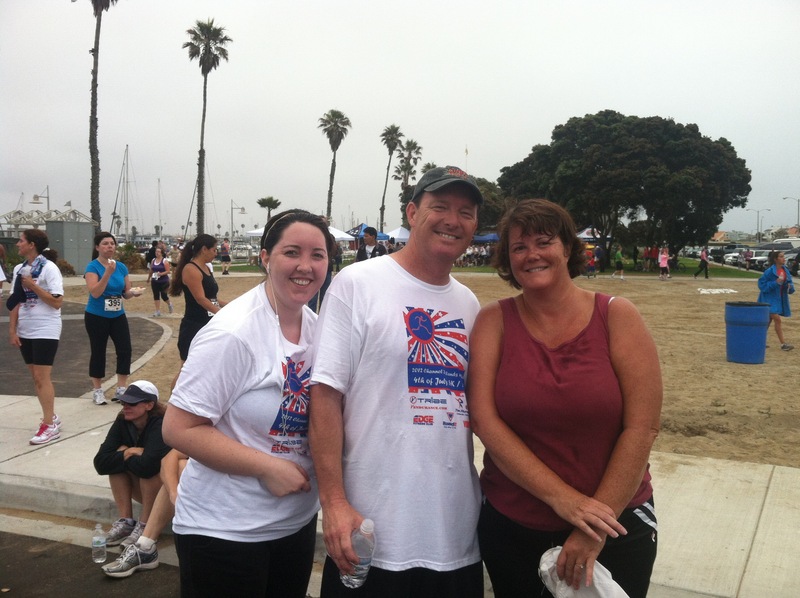 So, I signed up the Ventura Marathon again…and I signed up for a group training program. This was one of my best decisions! I successfully took close to 45 minutes off my time (finished in 5:04:36). 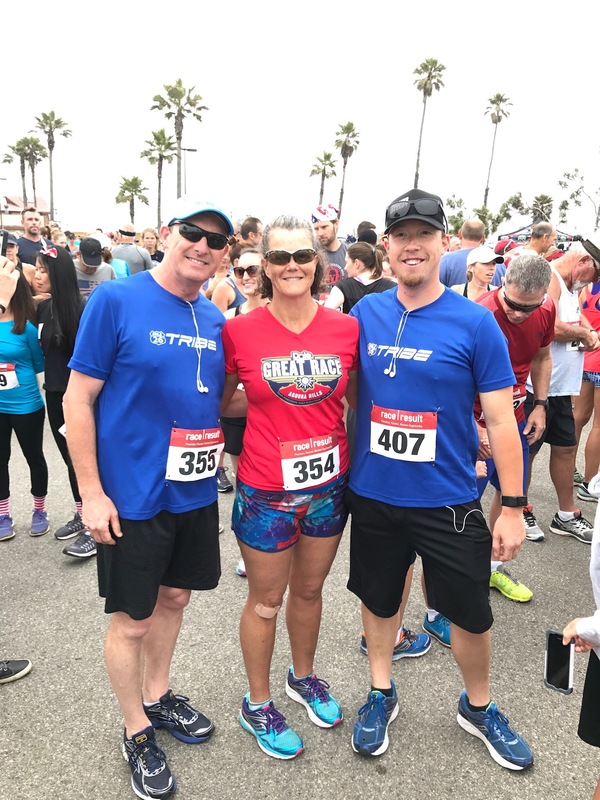 After this I started working with Josh Spiker with the long term goal of qualifying for the 2018 Boston Marathon. With Josh’s help I’ve gotten closer and closer! What to do after a disappointing finish? Remember! That was the purpose of this photo…relentless forward progress. Tomorrow is my second attempt to qualify. The first was Carlsbad last January where I missed the qualifying time by 4 minutes (4:14:20). I’m ready…scared…ready…nervous…ready! Now I get to wait about 24 hours…and I’m ready! Today I’m personally thankful for: the running support from my husband, Scott; good coaching; the ability to run.